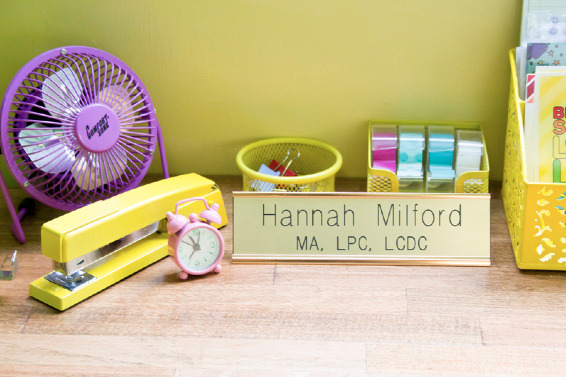 I'm really excited to introduce the lovely Hannah Milford and her business, Happy Camper Counseling. 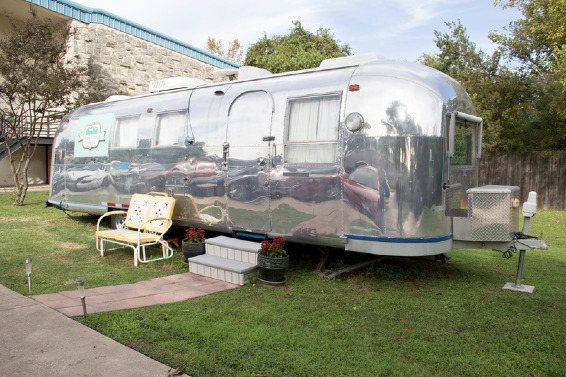 The adorable Airstream business is located in Austin, Texas. Hi Hannah can you tell me more about your business and Happy Camper Counseling? 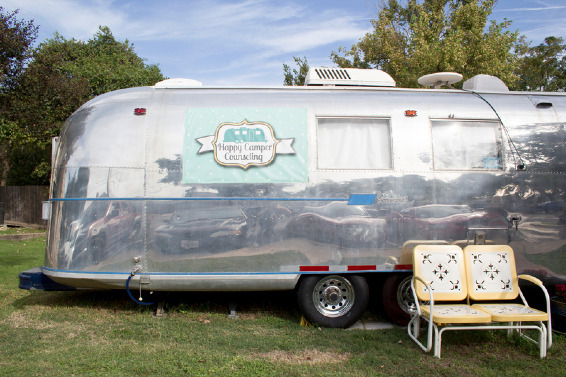 Hello, my name is Hannah Milford and I am owner and creator of Happy Camper Counseling, the first and only Airstream counseling office. 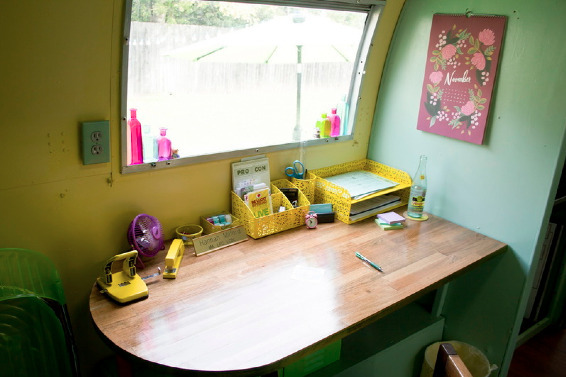 After working in the mental health field for 8 years, I launched my Airstream private practice in September 2013. Happy Camper Counseling is a fully operative therapy office located in Austin, Texas. 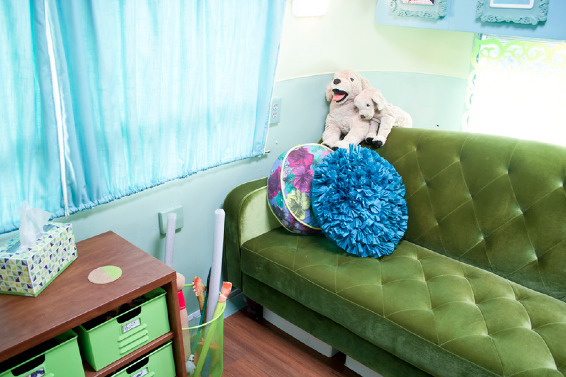 How did you come up with the idea to bring therapy into an Airstream? Austin is known for keeping it weird. 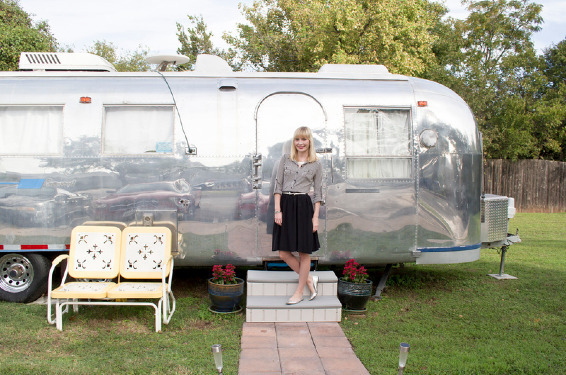 We started the trailer trend with Airstream businesses offering tacos, taxes and cupcakes. Why not counseling? 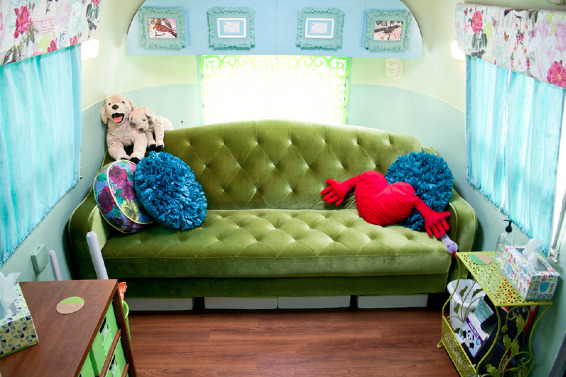 I love the way your Airstream is decorated! Since I know you rather well, I know you love crafting. How does your business refelect your personality? Thank you! 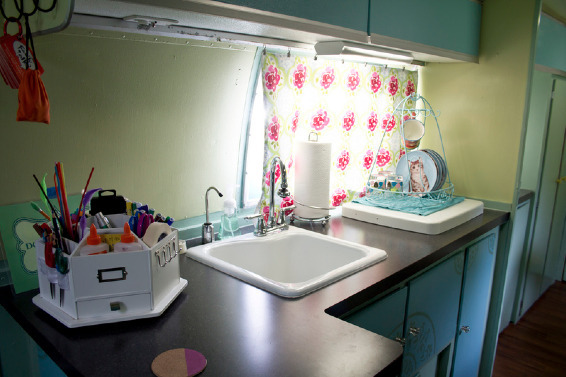 The Airstream’s decoration definitely reflects my personal style. I sought to create an environment that’s quiet and comfortable yet colorful and fun; vintage shabby chic meets Peewee’s Play House. How did the decoration process go? The decoration process took two years of weekend restoration. Designing and planning took a lot time, having to take into consideration space maximization and how color can affect a person’s mood. I still consider it a work in progress. I’m always changing and adding new things. It has been a fun process! What kind of counseling do you do? Who comes to see you? I am a Licensed Professional Counselor, Licensed Chemical Dependency Counselor and Registered Play Therapist. I counsel children, teens and adults on a variety of issues. I specialize in treating anxiety, depression, child behavioral concerns and impulse control. Tell more about your approach when working with children? How can counseling help? 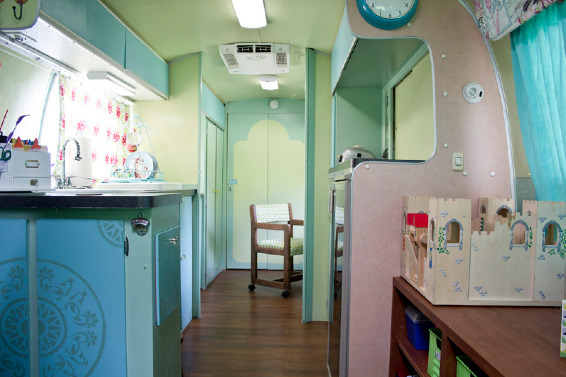 Happy Camper Airstream is a specially designed playroom that gives children a safe place to explore, learn, and build confidence. I engage children using creativity and art with expressive methods, like Child-Centered Play Therapy, Sandtray Therapy and creative Art Therapy techniques. 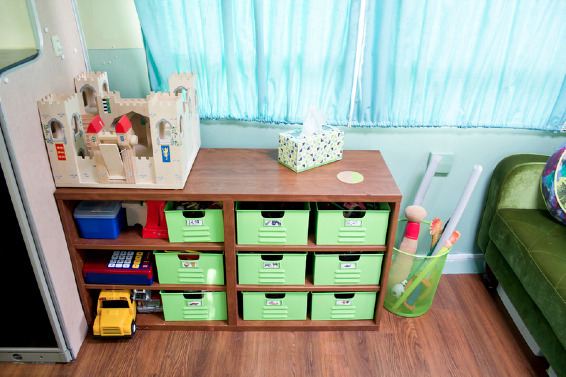 Using play and imagination in counseling can help children successfully resolve core issues in a powerful way. I saw on your website you also do parent coaching. How do you go about approaching parents? Parental involvement in counseling is so important. Parent coaching, also known as Filial Therapy, believes the parent is the most influential person in the child’s life. Working as a team, I help parents tune in to their child’s emotional needs and learn how to respond with greater understanding. Counseling teaches parents how to create safe and affective boundaries, while strengthening their relationship with their child. Individual Psychotherapy is also available to adults and teens. Traditional talk therapy allows clients to address their personal concerns in a safe and supportive environment. While in therapy, clients are empowered to make significant life changes with increased self-awareness and practical coping skills. What do you see for the future of Happy Camper Counseling? I have lived in Austin for over 20 years and I truly love this town. I am excited to establish my professional roots here. I plan to keep creating, learning, growing and helping Austin families. I want to contribute positivity and hope into our community. How can someone schedule an appointment or get more information? The first step would be to visit my website, www.HappyCamperCounseling.com. My website has information about scheduling appointments, pricing and office location. Anyone can contact me to discuss treatment options or for more information.